Want to get away from the main crowds that visit our much-loved Kakadu National Park? Happy to take the harder route, supply your own food and water, as well as be totally independent from shops, phones and all the mod cons of caravan and camping parks? Prepared to get wet and dirty while taking the hike to see the best this gorge has to offer? If you've nodded to all of the above, you've gotta check out Koolpin Gorge. Whoaa, don’t go heading of like a bull at a gate, as the local rangers only allow 40 people in at any one time during the dry season. In the wet, it’s closed. You’ll have to fill in a permit (which is free) to get a camping spot or even for a day visit, so be sure to do this well ahead of time to avoid disappointment. There are a few tour companies that take visitors in on a regular basis, but privately owned and independent travellers can gain access with this permit also. Just before you head in, you’ll have to make a stop and dish out a refundable $50.00 for a key to the locked gate at the entrance to the gorge track. Without the key, you’re wasting your time driving out there. You’ll also need to have paid your $25.00 (for a 14 day pass) just to get into Kakadu National Park, let alone the daily camping fees for the gorge, which are $5.00 per day per adult and kids under 16 are free. Of course, while you’re passing the Mary River Roadhouse, this is your perfect opportunity to top up with fuel and restock the basics of food and drinks. Your main shopping should have been done back at town. While the 4WD track in won’t be the hardest drive in the world, you do require a decent amount of ground clearance and be able to negotiate a few harder sections depending on track conditions. Once in, there really isn't too much driving to do, so be sure to put out the solar panels to keep the battery charged for the duration of your stay as generators are not allowed. The Koolpin Gorge (Jarrangbarnmi) walk will take a couple of hours, including photo stops and taking your shoes off to walk the creeks, drying your feet, wiping off the sand and slipping the boots back on. You’ll do a fair bit of rock hopping and in some parts there is no designated or signposted walking track. Provided you keep to the banks of the creek, you can’t go wrong. While the tracks aren't too hard, you’ll need to be reasonably fit to contend with the heat and carry a backpack of food and drinks, or in our case we backpacked one of our kids in as he was still a few months shy of being old enough to walk himself; lucky him, ‘cause he got to sleep on the way out after all that energetic swimming! There are no walking platforms, viewing spots for photos or any other such high volume touristy prompts, so you’ll have to keep an eye out for nature at its purist and wildest. We spotted plenty of bird life, wallabies and scaly creatures – not being an expert on all things that fly or walk on four legs, let’s just say they were feathery, furry and frightening sights – all brilliant and a great learning class for the kids. There are overnight bushwalks available, but an extra bushwalkers permit is required on top of the access permit. All great walks culminate in a swim (croc free spots preferably) and Koolpin doesn’t disappoint. We spent hours lolling in the rock pools, soaking up the massaging waterfalls and trying to teach our young fella the fine art of dog paddling. The most he could do after a few hours was to roll belly-up and giggle – I guess it was too much to ask of a non-walker to master paddling or backstroke! Sunning ourselves on the red rock platforms while nibbling on our food was a great way to ready for the walk back to camp. For the more adventurous, keep in mind that if you think there is no way up the huge cliffs, there is if you look in the right place. After a steep scramble and subsequent climb back down the other side, there are more rock pools, beaches and lazing on the warm rooks to be done. Of course, while you are anywhere within Kakadu you are visiting aboriginal lands, so pay due respect. At Koolpin Gorge there are a number of significant (or sacred) sites which must be avoided – not only will the Rainbow Serpent seek out your campsite and potentially destroy it, then squash your 4WD so you can’t get back to civilization, you’ll also be whacked with a maximum fine of $5,500.00 from the mob that control the area. Signs are erected to show of these significant areas, so you should be right if you follow their instructions. Once you’ve finished your stay at this gorge, you’ll have to return your gate key, then you’re free to take on the hoards of the more touristy spots. 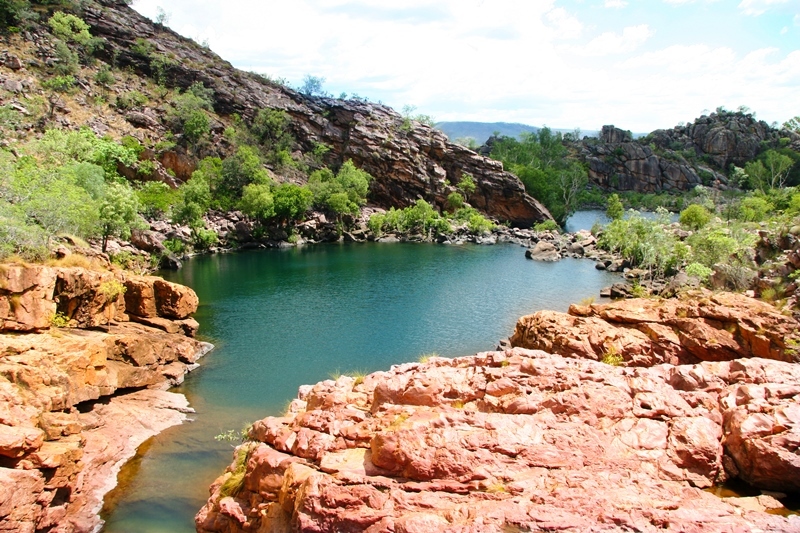 Our bet is you’ll put the lessor known Koolpin Gorge at the top of your best spots in Kakadu. Heading north from Katherine to Darwin on the Stuart Highway, Northern territory, turn right at Pine Creek into Kakadu Highway. A quick stop along the highway for your gate key then take the Gunlom road on your right (about 69km from Pine Creek township and 11km past the Mary River Roadhouse), then follow the tracks towards Jarrangbarnmi – the locals name for Koolpin. Turning left off this last track would take you to Gunlom Falls and if you miss the Koolpin turn off (at the locked gate) you’ll end up at Gimbat Picnic area. We used the HEMA ‘Darwin Region’ and ‘Top End and Gulf’ maps and had no problems finding the tracks. There is a drop dunny at the campsite, no showers or other facilities, so you need to be self-sufficient. There is an emergency radio on site, but is strictly for emergency use only. Campfires were allowed during our visit. You’ll need your own tent, camper trailer or the like for your accommodation. There is no on-site or hire accommodation. Mary River Roadhouse (phone (08) 8975 4564) on the Kakadu Highway is the last stop for fuel and basic food and drinks. All else can be purchased from the township of Pine Creek on the Stuart Highway, Darwin to the north and Katherine to the south. Kakadu National Park entry fee is $25.00 for a 14-day pass. To gain access to Koolpin Gorge, you need to fill out a permit. Phone 08 8938 1140 or email kakadunationalpark@environment.gov.au or download at http://www.environment.gov.au/resource/access-jarrangbarnmi-koolpin-gorge. The permit is required for day use and overnight camping. Camping fees (payable to the collection box at the campground) are $5.00 per adult and kids under 16 are free. This is high-clearance 4x4 country only, so leave the family sedan and on road motorhome at home. You’ll get in with an offroad camper trailer or dedicated offroad van.